In percentage terms also, the rally this year is the biggest since 2009 (81 per cent). Riding high on the sentiments, the stock market is gearing up for its best performance in five years with a rally of over 6,000 points in the benchmark Sensex in 2014 - which also saw the investors' wealth hitting Rs 100 trillion level for the first time in history. With just four days of trading left this year, the Sensex has rallied by nearly 29 per cent so far in 2014 with a gain of 6,038 points - the highest annual gain since the year 2009 when the bluechip index had rallied by 7,817 points. Besides, the Sensex also has a chance to clock its second best ever annual rally this year, if it manages to end 2014 with a gain of over 6,500 points (recorded in the year 2007). 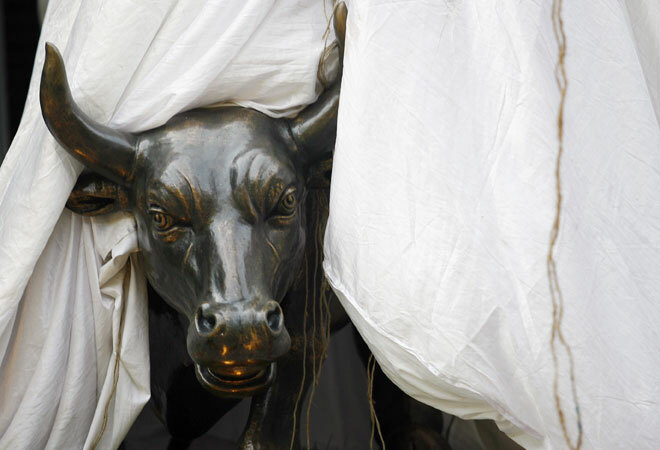 The year also left behind a trail of bullish fervour even as market participants strongly feel that 2015 would belong to bulls with no major negative factor in sight and market driver FIIs all set to pour in their investments in Indian equities. Experts attribute the rally in stock markets during 2014 largely to the thumping mandate given in general elections to Narendra Modi-led government at the Centre and the subsequent boost to the investor sentiments. The other benchmark index Nifty has also gained nearly 30 per cent, while both the indices crossed several milestones before turning sluggish towards the end of the year amid sale of shares by foreign investors. The Sensex clocked a peak of 28,822 points this year and currently stands at 27208.61 points, while coming a long way from a low of 19,963 points hit in February. The Nifty also logged its low of 5,933.30 points in February and now stands at 8,174 points. The year 2014 also marks the third consecutive year of gains for the stock market, after a sharp plunge in 2011. However, this year's gain is much higher than a 9 per cent rally (1,744 points for Sensex) in the last year 2013. The market players expect the buoyancy to continue in the New Year on anticipation of fresh economic reforms. The investors are also looking forward to the divestment programme gathering momentum after a successful sale of five per cent stake in public sector steel giant Steel Authority of India Limited (SAIL). The government has lined up a host of PSUs including ONGC, Coal India and NHPC, for disinvestment in the current fiscal, targeting Rs 43,425 crore through the stake sales. The new government also took steps to lower subsidies and cut the fiscal deficit, while easing FDI rules in various sectors. The year under review witnessed many records as indices across-the-board kept on hitting new peaks at intervals on the back of hectic purchases by Foreign Institutional Investors (FIIs). Retail investors too flocked back to the stocks to get their share of profits. As a result, the BSE small cap index and midcap indices also zoomed and outperformed the Sensex. For the first time in recent years, all 12 sectoral indices have registered huge gains and seven of them even scaled new peaks. The indices of Bank, Consumer Durables, Healthcare and Auto stocks were the biggest winners. Investors' wealth crossed Rs 100 trillion mark for the first time ever on December 3. Positive global developments also enlivened the market sentiment. The major factor on global scenario was a sharp fall in oil prices. The Brent crude oil prices tumbled to a five-year low below $65 a barrel at the fag end of the year. There was a considerable boost in the US economy as also a financial stimulus announced by European Central bank (ECB), China and Japan to support their economies. Back home, the sustained foreign capital inflow, fall in inflation in the last quarter of year, fresh reform initiatives by the new government also set the positive tone in the market. Foreign Portfolio Investors (FPIs) have injected a massive Rs one lakh crore during the year. The rainfall, which was forecast to be below normal by Indian Meteorological Department (IMD), too turned out to be better, providing yet another impetus to the market. FIIs remained consistent buyers in Indian stocks as US Federal Reserve had continued reducing monetary stimulus for the US economy. They had signalled interest rates hike but later maintained a commitment to keep interest rates near zero for "considerable time". Fed's bond buying programme has been a source of liquidity for most Asian and emerging markets over the past few years. Overall, a large number of Sensex-based stocks are gearing up to end the year with gains ranging from 1 per cent to 90 per cent. Only a few stocks that have remained relatively weak and they include NTPC, Tata power, Tata Steel and Wipro. Major gainers from the Sensex pack include Maruti Suzuki, Axis Bank, SBI, ICICI Bank, Cipla, BHEL, HDFC, HDFC Bank, L&T, Sun Pharma, Bajaj Auto, Coal India, Dr Reddy's Lab, Hindalco, HUL, M&M and Tata Motors. Among the S&P BSE sectoral indices, all 12 sectoral indices are likely to close with gains and the prominent gainers include the indices for consumer durables, capital goods, auto and healthcare sectors. Second-line stocks too attracted heavy buying interest from retail investors and outperformed the Sensex.